2 Sweet Friends + 1 Husband’s Birthday = 1 AMAZING Suns Game! 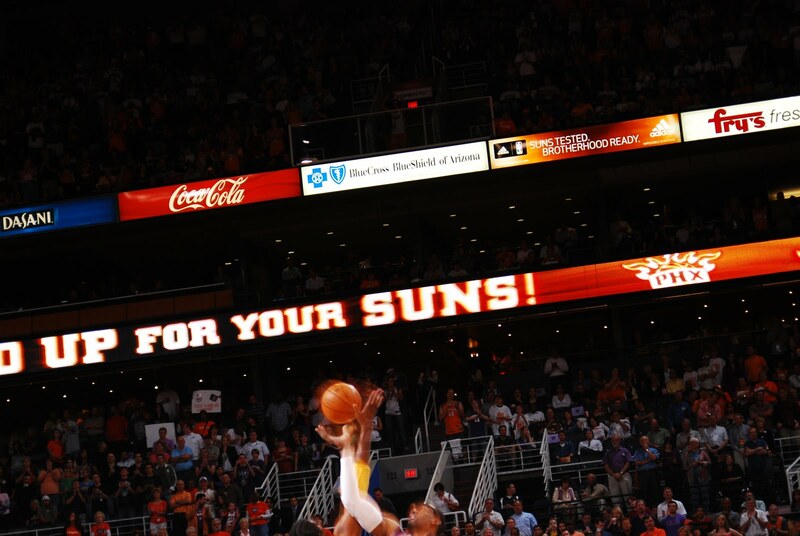 In case you haven’t heard, Terry and I had the awesome privilege of going to the last Suns home game of the season this past Tuesday against the Denver Nuggets. And you know what made it the most fun EVER? We got to sit in the FRONT row!!! Yes, on the floor just a single NBA basketball player step from the court. Let me start out by admitting that even though it was intended as an early birthday present for Terry (his bday is May 13), I probably had as much or more fun than he did. I was so excited that I could hardly sleep the night before and I kept catching myself just before I would blurt out something about it in the days prior. 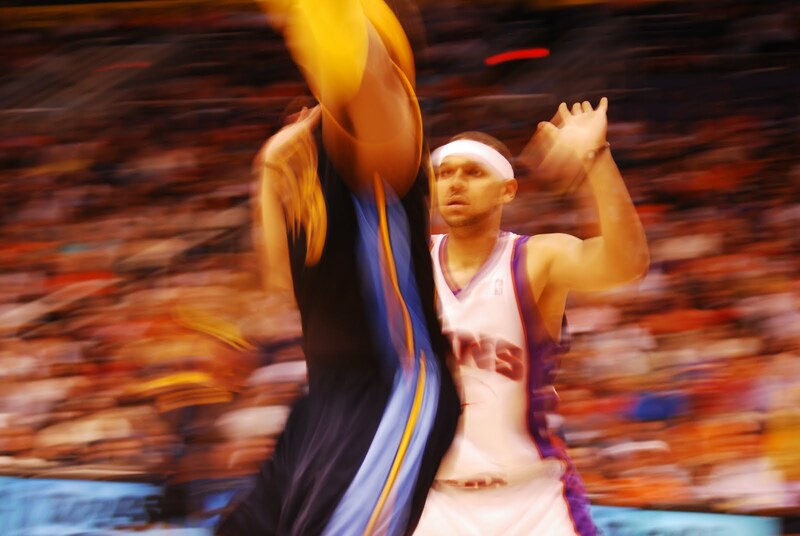 You see, Phoenix Suns basketball is my absolute favorite sport to watch. Even though Terry watches nearly every team sport with legs, and has tried to teach me about all of them, my first sports love is those “Sunnies” (as my son-in-law calls them). I fell in love with them back in the mid-70’s in the early days of our relationship. That was when he took me to a game and I thought that all they did was run up and down the court and whoever made the last basket won. Now I know most of the players by name and position and can point out a pick-and-roll or an alley-oop when I see one. I have realized that the reason I like basketball more than other sports is because it’s a more relational game. There are no helmets to block their expressions and there’s constant movement and interaction between the players. 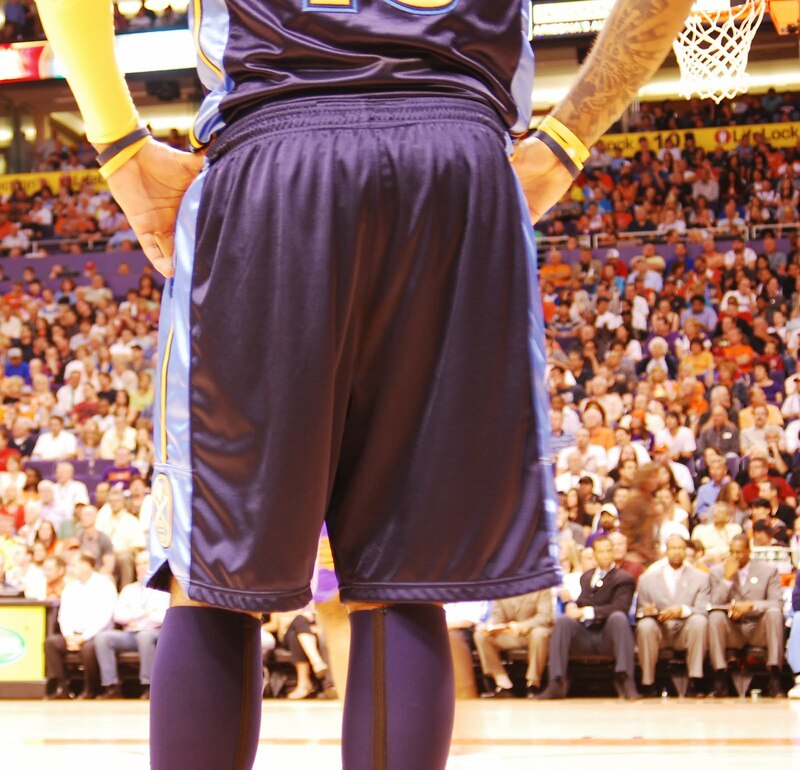 I love to isolate on one player and follow them on and off the court. Not in a stalking sort of way, but like a proud mom watching their favorite “Sun” and their progress. I generally choose my favorites, based on personality and temperament, not necessarily their accomplishments on the court. Anyway, I could write a whole post just on my love of the game, but I’ll save it for another time. Fun stuff! 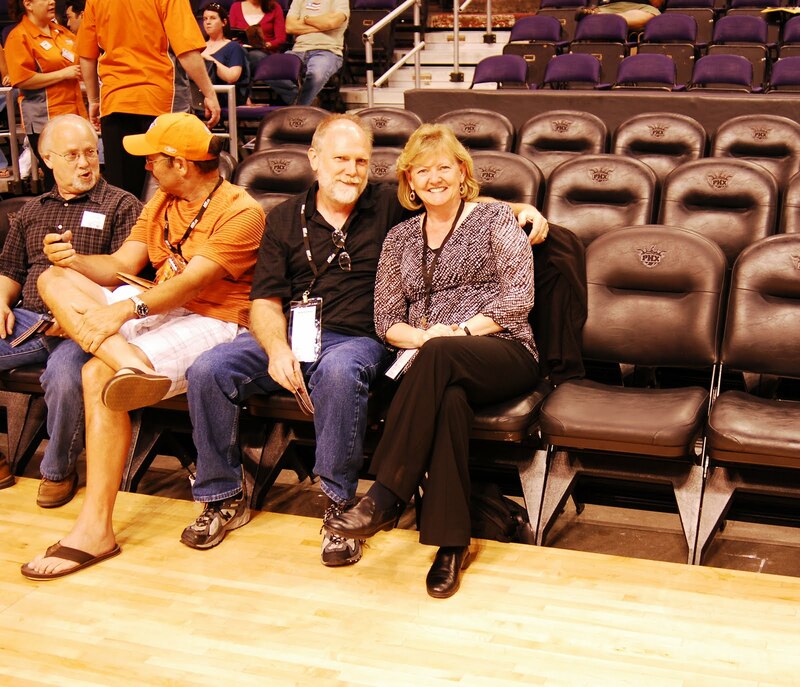 Terry figured out that we were going to a game, which didn’t surprise me because I had taken him to Suns games for his birthday before. But he had NO IDEA where we would be sitting and the other treats that were in store for him. It was so great to see his eyes open wide with surprise when we pulled up for valet parking, then walked into the building and found our way to the special entrance for these ticket holders. We held 2 tickets for ROW A, Section 113 but I hadn’t showed them to him yet. I didn’t tell him about the free food throughout the game at the AOT Club either. I was trying to be discreet so as not to look like a total geek, so here’s a shot of the club from my camera location at my side. To the right you’ll see the underside of the seats that are behind the basket. Up ahead are the food stations where we had our choice of so many tasty treats. One of my favorites was the 4-cheese mac-n-cheese. Mmmm…it was good and probably tasted even better since I’ve been trying to watch calories lately and have been staying away from things like that. There were several meat options and all the sides you would want. Free beverages too. We arrived fairly early because we weren’t sure how crowded it would be and weren’t sure exactly where we were going. 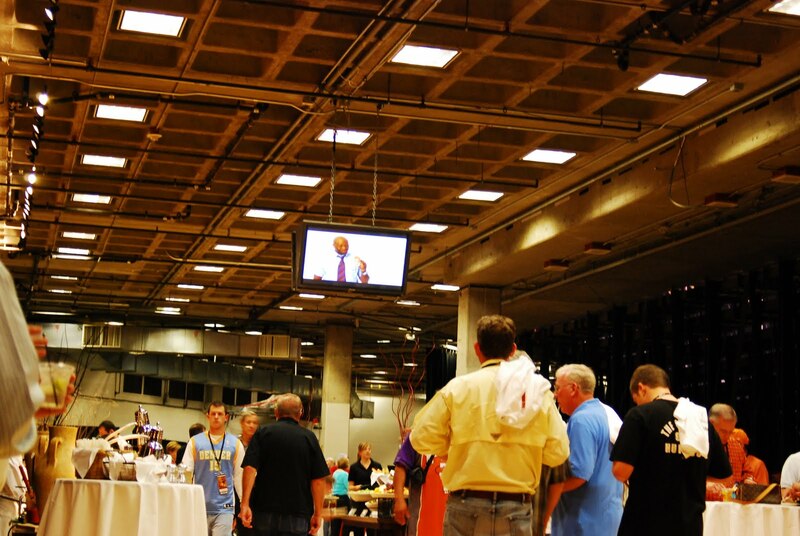 When we entered the club we were warmly greeted and got the low-down on how things worked. Fortunately, we had plenty of time to have some dinner and even stop into the Team Shop. Afterward we sauntered out to see the players warm up before the game started. If we had chosen to, we could have stayed in the club and watched the players come out of the locker room and go thru the tunnel. It’s just beyond the eating area above. These are really OUR seats for the night! Yup, front row. 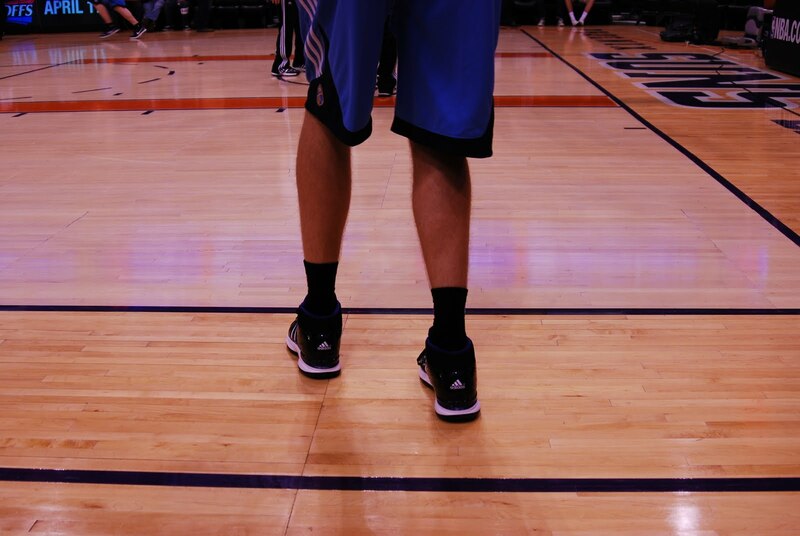 Our feet are on the sidelines very close to the baseline, directly across from the visiting team’s bench. We’ve sat down in this area before to watch the teams warm up, but never for the whole game. This is what the Denver warm ups looked like from our seats. He’s standing between the 3 point line and the out of bounds line. 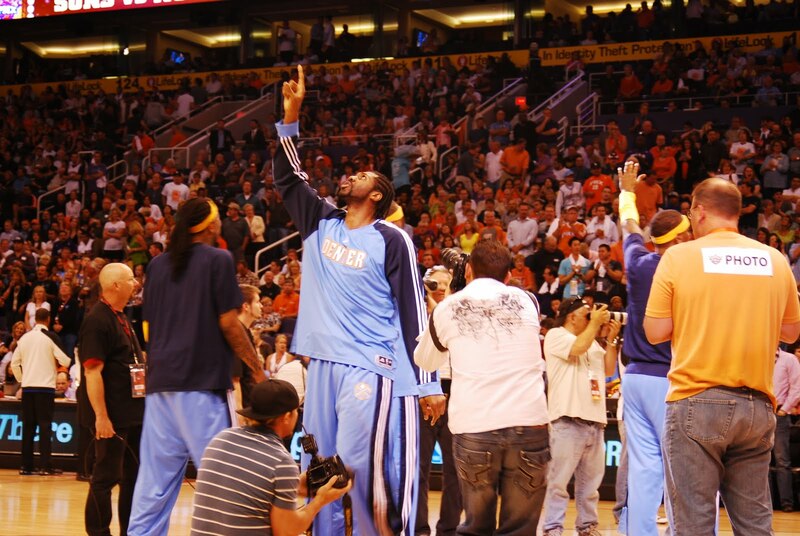 This is Nene Hilario coming on the court for the starting line up introductions. 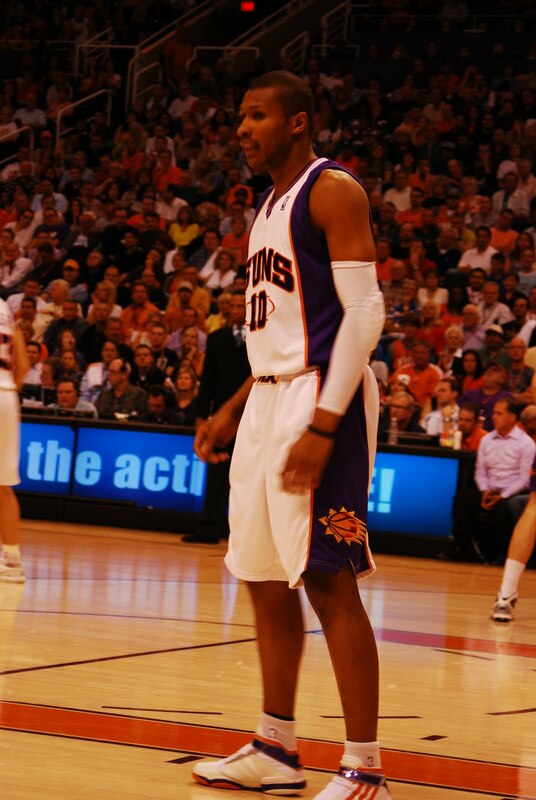 Apparently he legally changed his name to just Nene, which is more of a nickname – Brazilian Portuguese for baby. He’s good friends with Leandro Barbosa. What I really need to know is how can I get one of those “PHOTO” stickers for the back of my shirt. Of course my camera’s not as big as theirs, but it would still be fun to be able to wander around all over the place to take pictures. And I must say that the male/female photographer ratio is very imbalanced. I could help with that. This is the opening tip off. Since Denver is one of the most tattooed teams in the NBA, I wanted to try to get some pics of some of them for our son-in-law, Andrew’s benefit. 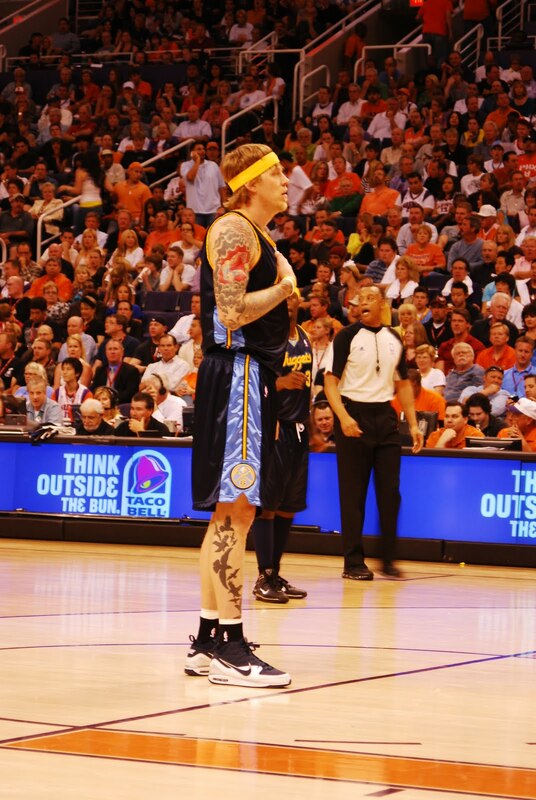 Chris Andersen is a prime specimen if you like tattoos. 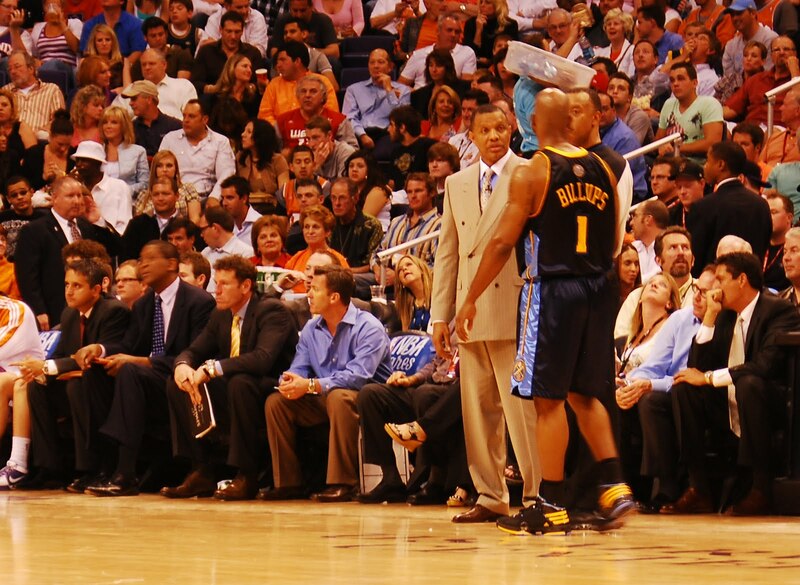 Here’s a fun action shot with Grant and Amare making a great effort at guarding the Nuggets. Sometimes this was the view that we had from our seats. We’re willing to make that sacrifice for the location that we had. I must say that the target was very tempting. And of course we need a shot of LB since he’s our daughter, Amy’s favorite player. This is the best one I could get. The Brazilian Blur doesn’t stand still for very long. 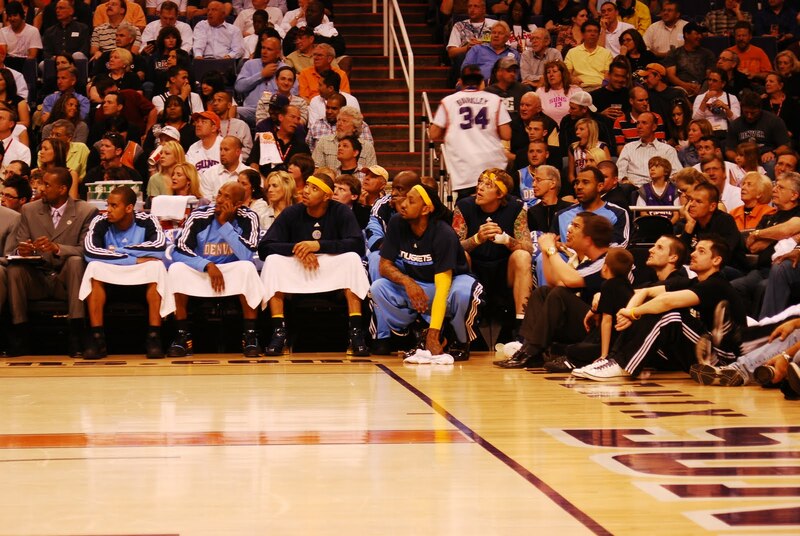 Isn’t it interesting how intent the guys on the bench are watching everything? Our favorite coach, Alvin Gentry! He’s doing an amazing job this year. I love the way he’s allowing the bench to play in tough stretches of the game. The young guys are growing more and more skilled and confident because of his trust in them. Their new defensive emphasis really seems to be making a difference too. 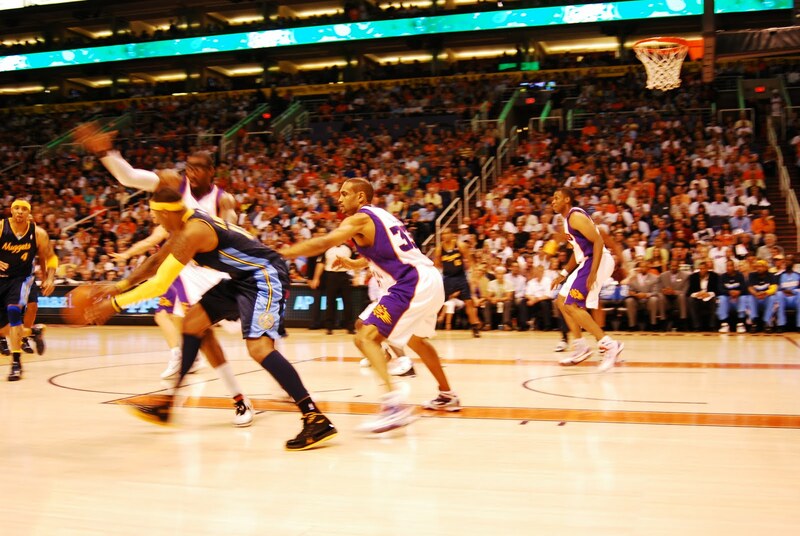 The final score of the game was Suns 123 – Nuggets 101. It was so fun to watch and even more so because they won the game! What a special treat to be able to enjoy it from court-side. Wow! It was a night that we’ll never forget. We were so thankful for the chance to do this. That’s one thing that I can cross off of my “Bucket List”. Such a fun post Nancy! !Love all the "close-ups".What a thrill-of-a-lifetime! !So happy for you & Terry! jealous! My awesome sunnies …. so so so fun!